All my fellow 4-eyed friends out there will surely agree that a trip to the optician’s is the scariest visit ever, after a visit to the principal’s office with my parents. Except that, to my parents, the former would be far more influential. I promise you that any parent would rather sit and listen to some old know-it-all jabbering about what they think my future is going to look like, than go to a optical center to look for new glasses. My glasses broke a few days ago and I knew I had to fix it. But my dad’s getting old and I don’t want to kill him, so I just put some superglue (Fevikwik) on it and hid the whole thing from my parents. Until, one day we were working on a project together, and I kid you not, my glasses just simply fell in two different pieces. I’ve been superglueing it every now and then but this time I forgot. This was how the glasses broke. So, then we went to the optical center and bought a piece of molded plastic and returned home with the question of whether I can afford to go to college next year. I was broke in one day. You may be surprised by the answer, but the whole reason behind all this fraudulence is ONE COMPANY. LUXOTTICA. Now if you don’t know what Luxottica is, it is basically the google of eye wear. They are probably the best example of a monopoly that you can give to anyone. They manufacture just about every lens frame that you can think of. They also own basically every premier wholesale store and retail stores. They control around 85% of the spectacles market. This allows them to set the price as they need and no one can ask questions. I’ll explain why later, but first, take a look at the companies wholly owned by Luxottica. Basically every premium eyewear brand. They also own the major retail stores. This would become a great asset for them. I’ll explain why later. These are the major retail store chains for eyewear. They control manufacturing, and Sales. What more could any company ask for. Not even Apple has this level of control over their products. Oh and did I mention they are merging with the world’s largest prescription lens company, Essilor. Essilor holds 45% of the prescription lens market. Together, they are a 50 Billion dollar behemoth. That’s more than Tesla Motors. This is how they stopped competitors and acquired so many well established brands. This is the reason why the retail stores a big asset to them. Retail stores are kind of they’re secret weapon. So in order to make a valid income, you pretty much have to sell Luxottica’s products and the other brands that they approve. 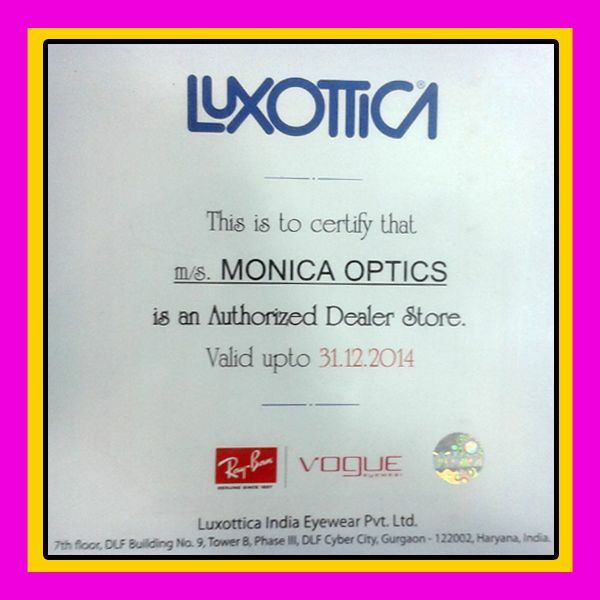 These stores have a little certificate that gives them the authority to sell Luxottica products. When I went to buy the new glasses I saw this certificate and that was when I got the idea to make write this blog. I couldn’t capture a picture of it, but it pretty much looks identical to this. Every eyewear retail store has this certificate. So Luxottica basically leverages they’re products with they’re stores and they leverage they’re stores with they’re products. It’s a symbiotic relationship. And now they are literally too large to stop.